In the spring of 2004 the lease was up on my brother Ed’s daily driver and to buy a little time before signing his next lease he began to look around for a summer driver toy. I was aware of a 1970 AMX stored in Ossian, Indiana and suggested he check it out. Ed met with Mike Gaudette, the car’s owner, and looked at the car but decided it needed more attention than he was able to give it for a summer driver. Fast forward to the spring of 2006: Ed suggests I look up the AMX thinking it might be something fun for us to work on together. I contacted the car’s mechanic (long-time AMC/AMX friend Mike Brady) and learned that Gaudette still owned the car, but it had moved to Brady’s pole barn just a couple of miles from my house. Brady was supposed to give it mechanical attention but seemed more inclined to help Gaudette find it a new owner. So, one evening I strolled down to Brady’s for my first look at the car and to see what kind of price might be on it. What I found was a September 1969 built ‘70 sold new at Wayne Love Motors in <?xml:namespace prefix = st1 ns = "urn:schemas-microsoft-com:office:smarttags" />Warsaw, Indiana to a James Evanatz on September 29, 1969. By October ‘71 Ernie Edgar of Fort Wayne had already became the car’s third owner. It had close ties to Ernie’s family as the second owner was a cousin of Ernie’s and his uncle’s name even appears in the owner’s manual as having done the cars very first dealership maintenance. Ernie and his family enjoyed the car for several years and in 1987/88, along with Mike Brady and another AMX’er Dan Herndon, completely restored the car. Credits to its past glory include a Best of Show award at a CACI meet in Livonia, MI not long after its completion. The Glen Green finish won “Best Paint” at a Fort Wayne Rod and Custom show at the Allen County War Memorial Coliseum even 10 years after Dan Herndon lacquered the car. There were some things I did not like about the AMX when I saw it in Brady’s barn. I wasn’t a fan of the color. Some of its mods (wheels and pinstripes) were outdated. It had acquired a few dents and scratches over the years. And professionally lettered across the rear spoiler was “The French Whore”…a nickname that Gaudette had acquired and chose to brand the car with. Yet as I looked at it I came to the realization that there were a lot of things that were really right about the car. It had just 59,000 miles. The restoration work had really been done well and had held up…chrome, overall paint, and interior…and it was a 390/4 speed car. Before walking out of the barn I made an offer and within a couple of weeks we had reached an agreement and the car was in my driveway. Well, first things first, “The French Whore” had to come off the spoiler because my then grade school daughter was quite embarrassed by it! Other friends were afraid to ride in it because they thought it might be a sign to other motorists of their virtue. Happily it came off with a little thinner and the rest of the work began to get this AMX back on the road. 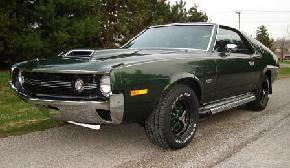 I must admit that this AMX does have some attitude and I have referred to her by her old nickname more than once! Years of storage, typical deterioration, and neglect necessitated a long list of challenging tasks: removing/cleaning/coating the gas tank; new brake booster and general brake refurbishing; water pump, plugs, wires, hoses, headliner, clutch…well, I won’t bore you with the 50+ little and big projects that went into the AMX that first summer. You’ve all been there. But suffice to say that if you run into me at a show, I can’t shut up about it! I sat a goal of driving the AMX to the AMO National at Dayton that summer and happily it pretty well came together. We had a great time with other AMCer’s and saw some fantastic cars…but there was a looming concern with my car. Regardless of weather and at inconsistent times it would just cut out. There was lots of guidance and many suggestions at Dayton and I even continued working on it on the show field before heading for home only to have the problem persist. A few weeks later the intermittent problem became constant and she came home on the back of Dan Herndon’s tow truck. I systematically changed more components and what finally cured it was a new wire between the coil and the distributor. I’ve had a great time with the AMX. My daughters love to go for rides although they aren’t any bigger fans of sitting in the back than I was when I rode around with my brothers in their ’68. And they haven’t figured out yet that the fuel consumption is eating into their college funds. My brothers Bill and Ed Souers, John Pontius, Dan Herndon, Mike Brady, Jim and Ian Webb, Jeff Kennedy, and my friend Deb McKinney are among the terrific souls who helped bring my AMX back to this point. But none of it would have been possible without the work and stewardship shown towards this automobile by Ernie Edgar during his years of ownership. On October 2, 2006, the 35th anniversary to the day of Ernie buying the car, he joined Dan Herndon and me in my garage for a few cocktails and a reunion. He hadn’t seen the car in a dozen years and what a delight it was to take him for a ride and to see him behind the wheel. Ernie showed us through his photo album and told us great stories of his years with the AMX. The highlight of the ’07 show season was at Garrett. As I was talking to some other club members about the history of the car and mentioned Ernie Edgar, a bearded stranger stepped forward to interject, “And I’m the guy who sold that car to Ernie Edgar!” Imagine my delight at meeting Ernie’s cousins Ken and Butch Plikerd. Ken had purchased the car after Evanatz traded it in with only 1500 miles on the odometer. Butch had a SC/Rambler at the time and was Ken’s mechanic on the AMX. He took responsibility for having drilled holes in the hood for hood pins, for mounting gauges in the center of the dash overlay, for adding the Trendsetters…one update that I’m a huge fan of…and for having disposed of the original stainless rocker moldings in a trash hole at the family farm. I took each of them a ride which meant a lot to Ken. Butch, on the other hand, commented, “I think Ken shifts a lot faster.” Apparently, if your right elbow doesn’t hurt after a night of cruising town and fending off Mustangs and Camaros, you’re not shifting right. A lesson I needed to learn! She’s put up for the winter now and I’m working on her stable-mate…a ’69 Bittersweet AMX I purchased from Dan Herndon this summer. It won’t be on the road for a while, so be looking for me in the green ’70 again next summer. We’ll go for a ride!